The Nissan GT-R transmission is catching a hard time on the interweb. There doesn't seem to be a post anywhere, on any forum that doesn't mention the problems that some people are having with the transmission. Owners are vowing not to use launch control. Some are afraid of the transmissions just giving up on them. Widespread panic...well maybe not panic. One of the members from the NAGTROC forum is reporting the price of the transmission assembly is going up from 1.6 million yen to 2.5 million yen for cars that come from outside Japan. My thoughts are that wheel hop is killing the transmissions. The problem with the wheel hop is with launch control, the GT-R spins the rear wheels. The wheel hop is exacerbated by the launch control. How do you stop the wheel spin and wheel hop ? You don't use launch control. This has been touted as a feature of the car and results in world beating 0-60 and 1/4 mile times. Some of the owners that have used launch control often, have broken transmissions and are now been denied transmission replacement under warranty. This is a tough subject. The line between abuse and doing something the car was built with. So what does Nissan do to fix it ? Damage Control. Damage Control is keeping a problem from getting worse. 1)Get rid of launch control. This will make no one happy. 0-60 times and 1/4 mile times will not be as "published". Doing this will not make anyone happy, and will cause a lot more problems. 2) Modify launch control. If they have the car launch at a lower RPM, it will wheel spin less, and cause less potential for breakage. The problem here again is that the cars will be slower, people will complain, magazines will complain. On low grip surfaces, there could still be issues with breakage. 3) Modify launch control 2. A little wheelspin in an all wheel drive car is the quick way off the line. Instead of turning the traction control OFF, the car could still have control of the rear wheel speed and keep the rear wheels from spinning and hopping so much on a launch. Traction control doing what traction control should do. 4)Make the transmission- differ- clutch- transfer-rear end serviceable. Send it out to someone and have them repair the broken parts. 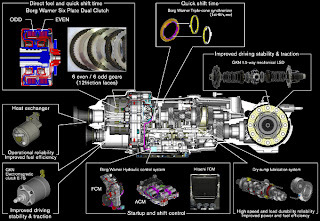 Automatic transmissions are rebuilt and returned to service, the GR6 should be the same. 5) Make the parts cheaper to replace. One broken gear does not a $20k transmission make. The gear and counter gear in the transmission would be $1000 in parts. Even at $5000, I don't think a lot of people would complain too much about replacing transmissions. similar to a 75W250 grade, while providing the same low fluid friction as an SAE 75W90. Similar to a 75W140 gear oil, but with the lower internal friction of an SAE 30 motor oil. The side benefit could be the clutches might be able to hold a little bit of a higher load without slipping. 7)Change the fluid path in the transmission. Separate the clutches from the gear set. Use a different fluid for the clutches and the gears. Something a little thicker to help out some of the shock loading. The clutches can keep their ATF. 8) Fix the wheel hop. They need a suspension engineer dedicated to figuring out why the car is wheel hopping, if that is actually whats killing the transmissions. It can probably be fixed, it might not be able to. It might be able to be done though spring/ dampening changes. 9) Try a clutch engagement change. If the clutch slips more, the tires spin less. Less wheel spin equals less wheel hop. However the issue now would be the clutch will not last as long. Since the whole transmisserdifferclutchrearend is an assembly, things don't change much. Its still a $20k part to change when the clutches need replacing. The transmission ECU does control how much and when the clutch locks up. This programming could be altered to smooth the launch off the line. Thats the first ideas I have come up with. i think some factory is designing some tougher gearbox and transmission, isnt that right?? maybe that's one of the ways as well?? One shop says they are having stronger gears made for it, but it requires a lot of research and development to design a properly functioning gearset. Once you make one stronger part, you find the next weakest part. i was thinking that wheel spin is good.? from talking to other members it seems like wheel hop occours and if you have stickier tires it will make the wheel hop worse and damage more. hence not a solution. THEN the other issue is - ceramic wheel bearings make the tires spin alot more but reduce wheel hop or eliminate it. it spins more but its faster in the long run. This theory of friction reduction is also shared with nissan, as tthey also used low friction bearings and other ways to reduce friction to dynos to 10% as they told everyone at the 360 event. The problem isn't really just the spin, but the spin and grab, spin and grab. The car shouldn't wheel hop if it hooks up and stays loaded. Its when the wheels spin, and they get traction and load and unload the suspension that causes the hop. You want less or more spin. I want less spin and more forward, not more spin and less forward. The Cadillac CTS-V has the same problem with wheel hop. GM would not do anything about it. Third party companies have designed kits that replace bushings, lateral bars, etc to eliminate the hop. The same will probably be true with the GTR. But that is months in the future. Sean you made a good point that if you beef up the weak link.....you will just start breaking the next weakest part. It's a never ending cycle. I'm not a mechanical engineer so I can't comment on the guts of the trans. But in my opinion (which isn't worth much) I would think to make the masses happy you would beef up the weak links until the weakest one, was the easiest and hopefully cheapest to replace. If you could push the MTBF of that part out to....oh 40 launches or so it might be ok. But one thing is for sure in motorsports, the faster you go, the more stress you create, the faster you break parts. Plain and simple. Don't like it, go buy a yugo. In my opinion alike what others above have mentioned is that the problem is shock loading caused by wheel hop or axle tramping. This is a suspension issue as pressure will tend to follow the path of less resistance, in this case it is easier to compress against the suspension than it is to grab traction and push the car forward under high load. 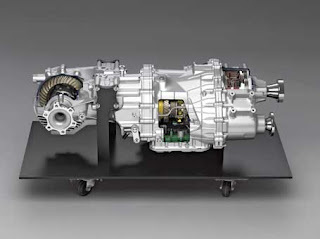 From what i can gather the twin clutch arrangement in the GTR is a very expensive and complex component. Only time and mass production/volume of these units will drive down prices. However a revised suspension system would be a step in the right direction. Don't get me wrong, I'm in love with the new GTR and every vehicle has its faults however I hope the future brings promising solutions for this awesome piece of machinery. Jaydus is right on the money - any power delivery system should have a pre-planned weak-link that is easy and inexpensive to replace. So the Clutches, Transmission, and Xfer case are all one piece and mighty expensive - where else down the line can we put a fuse? A simple place to put the fuse would be in the strength of the CV joints at each tire. Or build a torque limit point into the factory half-shafts. People who change these out for stronger aftermarket versions could be denied factory warranty coverage of the transmission. Or, if a more technically elegant model is required, build a critical (but replaceable) piece of the transfer case out of a temperature sensitive metal. If temps got too high and too much torque feedback is generated, the sacrificial part would fail without grenading the whole transmission. OR, it might simply be a matter of finding the right limited slip fluid for the rear diff. Since tied to the transmission, the rear diff should heat up at a rate similar to the transmission. If an ideal fluid can be found to lose its limited slip characteristics above a specific temp, it could cause a non-catastrophic kind of failure. As temps rose and the transmission system was threatened, the drivetrain would act like an open diff system, allowing one tire to spin and take the load off the system when temps and torque get too high. I just can't believe such a well developed expensive super car from Nissan has such an obvious problem. Didn't they test and test and test the GT-R before releasing it? It's such a simple test for the LC: Go to the drag strip and launch the GT-R until something breaks! And then figure out why. My guess as to why Nissan didn't do this thoroughly is that drag racing is never huge in Japan? My thoughts are if it's worth all these "comments"......we should all consolidate our thoughts and feelings and also any other "ideas" and send them Nissan's CEO......He's the one that said that it's a super-car and has got all the "trimmings" in-built. I'm already regretting having bought the GTR.....I've gotta to worry more about things breaking in the car than enjoying it now....!!! Seriously, I think Nissan should take ownership and replace the tranmission ( maybe limited replacements )and not make a "mockery" of having all the "talk" and no "walk"
Seriously Dissapointed Nissan GTR Owner. I've got a new GTR with the Double Clutch Transmission, and I think its a great car. At the moment I want to have look on the electronic transmission control unit, but Its not inside the transmission itself, so can somebody help me and tell me where it is? Maybe under the seats, but I'm not sure. The tranmission itself is very interesting. The TCM is behind the rear seats/in the trunk area. Thanks a lot! Is it easy to remove? So it is in the trunk area, right? I don't have to remove the rear seat, I have only to work in the trunk area? Tanks! Very good! This was a good help! So is it easy to remove? Do I have to remove the rear seats? Or is it only in the trunk area, so that i only have to work in the trunk area! Thanks! I would go from the trunk area. I wrote an article about Nissan and their tricks up their sleeves. I've owned 2 280zx Z'S, and 3 300zx Z's. In my opinion these cars should be reviewed in front of Congress, because they all were a piece of _ _ _ _, fill in the blank. If you want a nice put together car, get you a BMW or a BENZ. It took you 5 cars to decide that Nissan was tricky ? Ever own any other cars ? I am a car dealer, every car has its issues. Every brand has its issues. Cars don't last forever, and they require maintenance to last. So wheres this paper you wrote ? Send a link.